and whiskers on Mittens or maybe even mittens on Kittens??? Anyway. These are a few of my favourite things. On this day when it’s not sure what to do, first it’s rain, then it’s snow and now it’s wet snow and though it looks quite bleak and fairly miserable, particularly as I’m trudging down the drive wheeling the garbage bin! There is an air of optimism…Look! What’s that shining like a jewel in the wet, muddy ground? 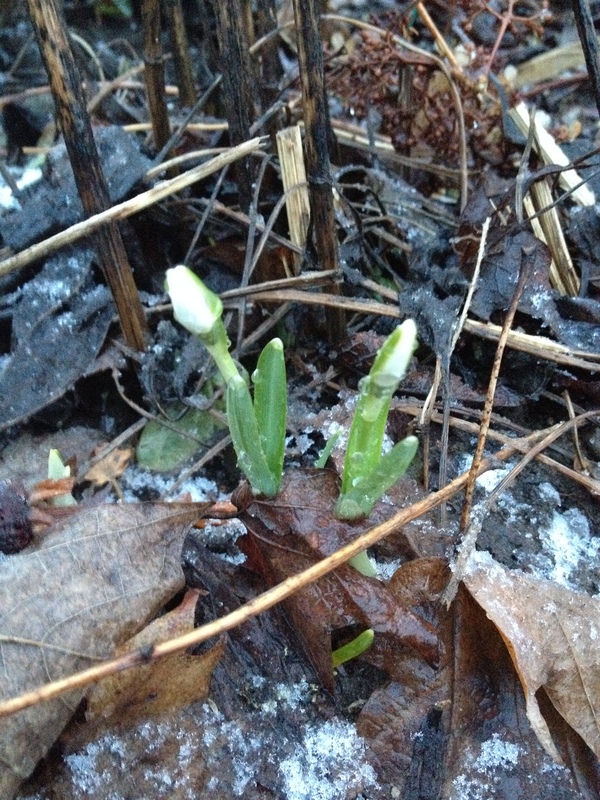 My little snow drops have dared to poke through the brown, soggy, snow covered leaves. Such troopers to show up on a day like today. The birds are singing. They are so brave sitting out there in that tree. I wonder where they went last night to hide from the howling wind and the terrential rain. My dog Ruby has realised, she doesn’t mind paddling in the pools of water thats a mixture of ice remnants and the rain thats steadily falling now. Even in this weather, she resists coming in to the house. She wants to sit in the mud with the stick that she just found…she’s not very lady like! And. I get to go plant shopping! I have a few orders for my little centre pieces, so I am heading out to get my spring flowering bulbs and some fresh Primula. I have the other bits and bobs that I will use. I shall do a show and tell when I start to make them up. So even though the weather may not be great, I have already found comfort in some of my favourite things. Terrific writing! I was right there wih you! !